In the tradition of the early naturalists and explorers, we will be learning about the place where we are by drawing and writing, listening and discovering, using the format of the Field Naturalist’s Journal. Clare will help you set up your own journal, using either the Artist's of the Scientist's eye, or both! In this class we will have an opportunity to explore the area in and around Shakerag for a week, using our journals to write about and draw local trees, rocks, geological outcrops, landscapes, waterfalls, plants, birds, and animals. We will learn to observe the natural world more closely by using the methods of writing and drawing to describe what we see. We will use pencil, pen and ink, colored pencils, and watercolor in our journals, so that we can prepare for our own continued exploration of the seasonal nature where we each live. Classes will include hands-on drawing lessons and writing methods, and all levels of experience are welcome: participants with no previous experience in drawing or natural studies are invited. *Note: materials with an asterisk are available for purchase in the Shakerag store. For over thirty years, Clare Walker Leslie has taught nature drawing and nature journaling in classrooms across the country, as well as in art schools, adult education centers, colleges, and universities. Her teaching matches the individual needs of each student, yet gives a broad introduction to the possibilities for continuing this study beyond the time of the course. She is a professional wildlife artist, naturalist, and educator, nationally recognized for her teaching and her many books on drawing and studying nature. 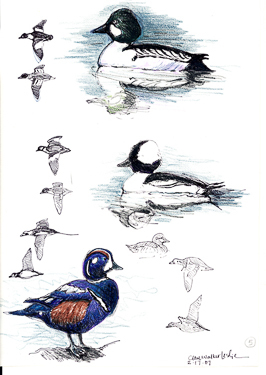 She earned her B.A, from Carleton College and has been trained in Europe in the study of wildlife drawing. Clare lives in Cambridge, Massachusetts and Granville, Vermont.